This NBA season has seen a spike in contentious behavior and talk between players and referees. Technical fouls are up, ejections are up, but most obviously, criticism is up. Referees aren’t available to the media, so we don’t have public instances of them criticizing players, but players are contractually obligated to talk to the media, so we have plenty of examples of them complaining about the refs. I guess that’s how the transaction works: a frustrated player complains after a frustrated official calls a technical foul. Which came first, the complaint or the technical? In a sense, this is nothing new: people have always rebelled against those tasked with keeping them in line. Even the most law-abiding among us feels a quickening of our heartbeat when we see a police car…the tension is real. It’s a fact of life. Let’s set aside for a moment the hilariously oxymoronic quality of his last sentence (No disrespect intended by my disrespectful comments) and focus on this point: he’s done with the refs. This is, itself, almost a non-sensical claim. 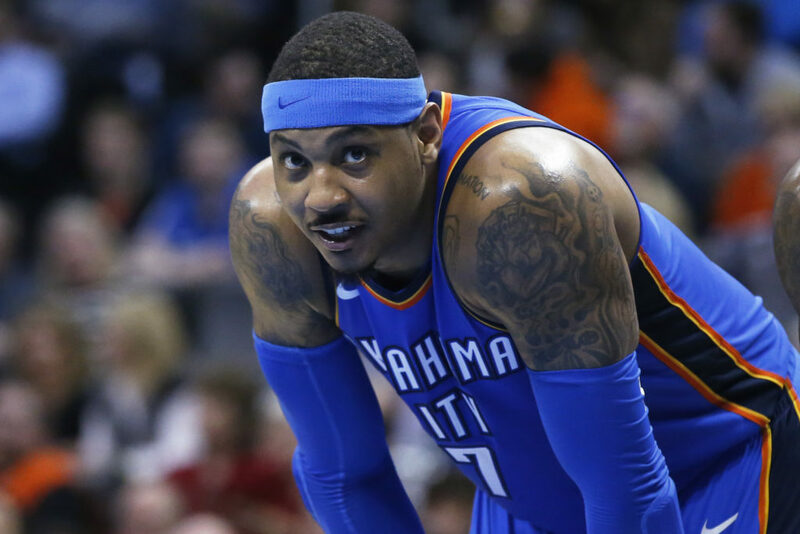 Unless he’s planning to retire from the NBA, Carmelo Anthony cannot, by definition, be “done” with the refs. They are employed and empowered by the league to police his on-court behavior. Period. It would make as little sense if I said “I’m done with the police.” I could more readily say “I’m done” with more obviously ubiquitous things like capitalism or toilets. Those things are more easily eschewed than the police. No matter how “off the grid” I go, the police have still be given jurisdiction over me. If I break the law, all my protestations that “I’m done” with the police will fall on deaf ears. Paul says in Galatians that “God is not mocked” (6:7). Part of what he’s getting at is that we cannot dismissively wave God away. Not believing in God is like not believing in gravity: it might work out okay for a time but it just means that the apple that will inevitably fall on your head will come as a great surprise. For example, there has recently been significant flooding in my hometown of Louisville, Kentucky, and I can imagine Carmelo Anthony looking out his Ohio River-side window (he doesn’t live here, but you’ll forgive the image) and saying, “I'm done with this flood. No disrespect, but I'm done with all that water.” Making such a statement makes us feel powerful, as though we have the authority and ability to banish the thing that constricts us, but it will not keep the water from pouring into our basement and ruining all of our stored Christmas decorations. When people dismiss God, they are usually dismissing his law: “I don’t want anyone to tell me what to do.” But God is not mocked; his law still condemns all people, for it is written on our hearts (Romans 2:15). This is why the people who are supposedly the most free, those who have rejected any overarching system, are just as weighted down by life as anyone else. God is not mocked, the law is real, and the floodwaters are rising. Better then, when you hear about a flood, to escape. Better then, when you hear the proclamation of the law (e.g. “Therefore you must be perfect, as your Father in Heaven is perfect” [Matthew 5:48]) to call out for a savior. Saying, “That doesn’t apply to me” is the same as saying “I’m done with the refs” or “I’m done with all this water.” It’s a good soundbite, but it doesn’t keep you dry, or in the game. The law was given—the floodwaters have come—to show you your need for savior (Romans 3:20). It applies to you. You’re not done with the refs. But the refs don’t have the final word over you. Jesus Christ has that, and his word over you is “It is finished.” You’re not done with the refs, but the refs are done with you.